I’ve decided to ring out the year with this recipe for Slow Cooker Chicken Pasta Fagioli, since it’s definitely feeling like soup season here in Phoenix. Temperatures have dipped into the 50s during the day and 30s at night (brrrr) and Rod (along with several other members of the family who gathered together for Christmas) has come down with a nasty nasty cold. I’ve somehow managed to escape it so far and pray that my luck continues. There’s nothing like a bowl of steamy homemade soup, especially when you are under the weather. I ripped this recipe from a recent issue (not exactly sure which one) of Weight Watchers Magazine, which I adapted somewhat, using canned beans instead of dry, pasta shells instead of orechiette, and adding some carrots and celery. Unfortunately, I failed to notice that the recipe called for way too much pasta (a whole pound) which totally absorbed all of the liquid. This could have been avoided if I had checked out a couple other recipes – (something I usually do) for comparison – like this pasta fagioli from SkinnyTaste or this Crockpot Pasta Fagioli from A Year of Slow Cooking – which both call for a lot less pasta. Fortunately, I was able to fix the situation by adding a lot more chicken stock, but I’ve modified the recipe here, cutting back the amount of pasta to 6 ounces or 1-1/2 cups, which also shaves off a couple of PointsPlus too! 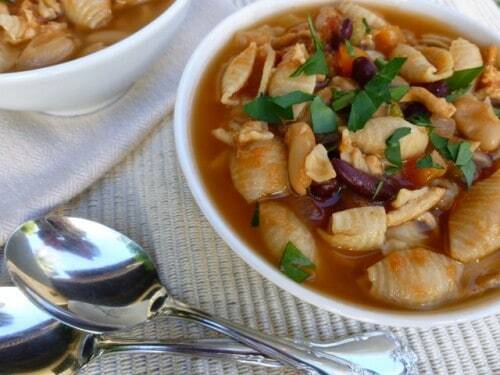 We really liked the flavor of this Italian pasta and bean soup. The fresh rosemary, thyme and bay leaves were the secret, I think. According to my calculations, each generous 1-1/4 cup serving of this chicken pasta fagioli has about 282 calories and *7 Weight Watchers PointsPlus. According to Weight Watchers Freestyle, this has decreased to 1 WW Freestyle SmartPoint per serving. Fresh rosemary, thyme and bay leaves are the secret to this great tasting WW Slow Cooker Chicken Pasta Fagioli. 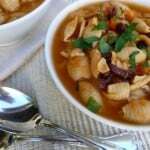 Use a 6 quart slow cooker or cut the recipe in half and use a 4-quart cooker. This makes a big batch of soup. Spray a nonstick skillet with cooking spray and set it over medium heat. Add the ground chicken and cook, breaking it up into small pieces with a wooden spoon until browned, about 5 minutes. Put the cooked chicken into the slow cooker. Put the thyme, rosemary and bay leaves in a cheesecloth bag and tie to close. (I didn't have cheesecloth so tied everything up in a clean empty paper coffee filter instead with good results.) Add it to the slow cooker. Add the onions, celery, carrot, garlic, broth, water, beans, tomatoes, tomato sauce, and salt to the slow cooker and stir to combine everything. Cover and cook until the vegetables are tender, 3 to 6 hours on HIGH, or 6 to 8 hours on LOW. Twenty minutes before serving, add the pasta to the cooker, cover and cook on hight until tender, about 20 minutes. Remove and discard the cheesecloth bag. Add extra chicken broth when reheating leftovers, if desired. This makes a large batch. Use a 4 quart slow cooker to make a half batch, if you prefer. 50’s? It’s definitely soup season here in Central Minnesota. It was -13 last night. The slow cooker has been broken out a long time ago! I know Christa. 50s doesn’t seem that cold. It’s amazing how quickly your blood thins out when you live in Arizona. I know it’s nothing compared to the cold of Minnesota, but it’s chilly to us!! This looks really delicious! I’ve pinned it!. I can’t wait to try it.